Paper Wasps are named as such because they build paper-like nests, which are constructed from cellulose (wood or plant) materials and wasp saliva. These nests are water-resistant and are usually gray or brown in color. Paper wasps are somewhat social insects with small colonies. Wasp nests contain cells that when constructed together look like upside down umbrellas. Wasps lay their eggs in these cell compartments. Paper wasps are brownish in color with yellow or reddish markings. Wasps have slender bodies and long legs. Wasps are mostly beneficial insects since they control other pest populations and assist in crop and flower pollination. They eat nectar, pollen and other small insects, including caterpillars, which are fed to wasp larvae. 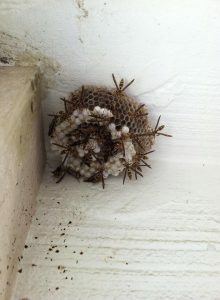 However, paper wasp nests do become problematic when they are constructed around a home or business. Wasps are typically located in undisturbed areas such as beneath eaves, porch overhangs, patio ceilings, eaves, railings, decks as well as under twigs and tree branches. There may be multiple wasp nests in different locations attached to a single structure. Wasps do not usually exhibit aggressive behavior; however, wasps may sting if they feel threatened or when defending their nest. Unlike bees, wasps can sting repeatedly and do not die after a sting. Wasp stings are painful and may cause allergic reactions. AmeriGuard Pest Defense offers wasp control services for residential and commercial locations where wasp are a problem. Our licensed service technician will perform a thorough visual inspection to identify the severity of your wasp problem. During the inspection, all sources of the wasp infestation will be identified and methods of wasp treatment will be discussed. Wasp treatment services are available on a Monthly, Bi-Monthly and One-Time basis. Residential customers on a regular General Pest Control Maintenance Plan will automatically be covered for wasp control services during regularly scheduled services. Your service technician will examine the exterior of your structure at each service for wasp problems. Check around exterior of building for wasp nests on a routine basis. Do not attempt to knock down a wasp nest on your own. Wasps will sting when the nest is endangered. Contact your wasp service experts at AmeriGuard Pest Defense for a free wasp control quote. Most quotes for wasp services can be provided over the phone by calling (951) 652-0505 without any obligation. AmeriGuard Pest Defense’s General Pest Control Maintenance Program includes control for wasp infestations. Catching a wasp problem early will ensure that it is taken care of quickly and efficiently before multiple nests are constructed.